Criminy. Another product I must go investigate. I have a few cubes from you and my babies are beyond happy. I'm talking pure bliss. Julius goes into his and he falls asleep, eyes closed; then Shrimpie will look inside the cube to see why his buddy is missing treat time :) I know why! He's knocked out. My girls love, love, love their huts! Lucy will drag her pellet bowl inside the hut, spilling the contents in the process, and then lie in there and munch away. The hammock is a fun place to hide under and eat lettuce. I'll put some pictures up when I get a chance this week. Now that student loans are in, I can start planning my next order (but don't tell my fiance that!) Have you come across any food-theme fabrics? Okay, three more questions before I order. 2. What is the cost for a hut with two openings? 3. 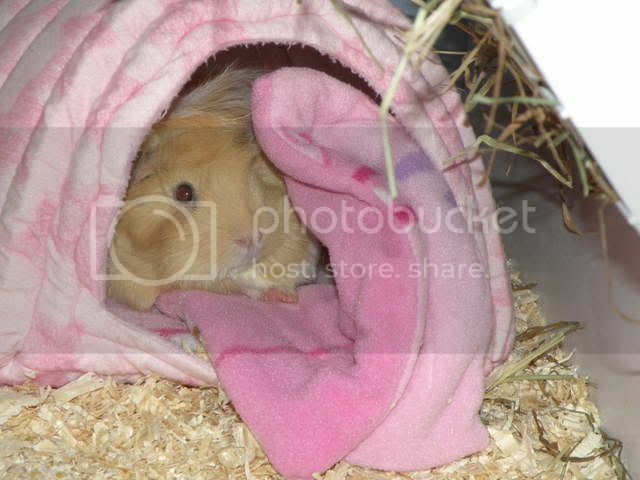 Can a guinea-pig-sized hut be placed inside of a cat-sized hut for shipping? I did find that the huts with openings on either end were less sturdy. I haven't made any for myself so Feylin might be better at answering that one. I don't know if it would collapse, but the ones with only one opening did seem more sturdy to me. I just charge $1 more for a second opening so it would be $21. I temporarily removed the cat huts. I want to make a few changes to them before I start selling them on here. Sorry for the inconvenience! Two entrances make for happier piggies when there are more than 2 babies housed together. Whatever one wants, the other one will want the exact one, hence I order cubes with 2 holes. What I do to compensate for the "sagginess"(even though it retains its shape) is put a cuddly cup inside the cube. They love it! Thanks for the suggestion. :) Do you have the hanging cubes rather than the huts? The huts do tend to colapse now- but I've washed them so many times they are fading. I think the huts get washed once a week or more! My huts might be of the version without the extra padding, too. Fred likes to drag the pellet bowl inside the hut too- food must taste better inside a hut. The huts with only one opening are still extremely sturdy even after many, many washes. I think making that second opening makes them lose a lot of structure, but the pinning idea was great. Feylin: I think I was using a thinner foam back when I made yours also, so that might contribute. I use a thicker size now. Here are two my six happy customers. Such cute little girls! I'm so glad Maddie is doing better now. Are you going to be getting any new fabrics soon? I just saw these last night, and I love them. I love the hammocks! My Isobel lives in her hammock haha. New guinea mom, i'm pretty stocked up on the fabric I have now but if you would like to email me privately and you want me to special order a certain fabric i'd be happy to do that. I can send you the links to where the fabric is that I order and you can pick what you like! 1. Can you make them with fabric selected and sent to you? 2. If so, what type of fabric and amount do you need? Yes, I would be happy to do that. I use either cotton or flannel. A 1/2 yard should be enough to make a hut. The price would be less also. I can make it without a lip also. I have done that in the past.